What links the birth, in September 1942, of a son to the wife of the Bahrain Government’s Director of Education, the marriage, in April 1909, of two American citizens from the American Missionary in Bahrain and the execution, in 1933, in Bahrain of a man from Najd who had been found guilty of murder? 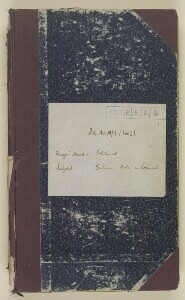 The Bahrain Agency’s political diaries and official correspondence contain countless mentions of births, marriages and deaths. 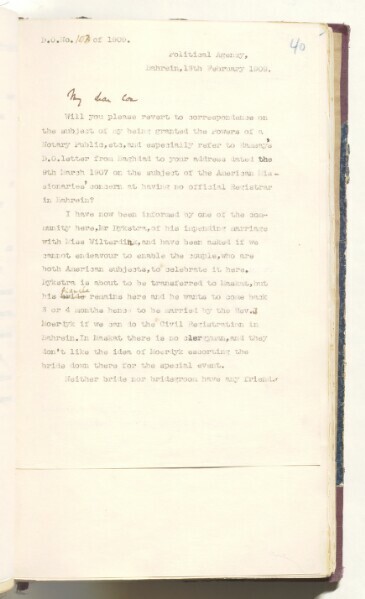 Sometimes they are discussed with grave seriousness, as was the case of the risk of a diplomatic fall-out resulting from the execution of a foreign national; at others with flippancy, as evident in the observation that the birth of the Director of Education’s son coincided with the visitation of a flock of storks to the Bahrain islands. Irrespective of their gravity, events like these were connected by the fact that, because they involved foreign nationals in Bahrain, the British had judicial authority over them. 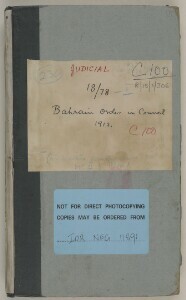 An ‘Order in Council’, declared by the British Crown, was required to establish a court of justice and enable British officials to legislate on judicial affairs in Bahrain. Captain Francis Prideaux, who was Political Agent A mid-ranking political representative (equivalent to a Consul) from the diplomatic corps of the Government of India or one of its subordinate provincial governments, in charge of a Political Agency. in Bahrain between 1904 and 1909, was unequivocal when it came to what he regarded as the fundamental requirements for consolidating British hegemony. He recommended that an Order in Council A regulation issued by the sovereign of Great Britain on the advice of the Privy Council (in modern practice, upon the advice of government ministers). be declared, giving him the power to deal with civil matters, including births, marriages, deaths, and the disposal of estates. The Order in Council A regulation issued by the sovereign of Great Britain on the advice of the Privy Council (in modern practice, upon the advice of government ministers). would also give him the authority of a district magistrate to adjudicate in criminal matters and the power of Vice-Admiralty (legal jurisdiction) in Bahrain’s territorial waters. In this way, though in reality quite inconsequential to British officials, the authority to issue birth and marriage certificates represented the thin end of a wedge, intended to consolidate Britain’s power in Bahrain. With the ‘Great Game’ (the name given to British and Russian imperial rivalry for supremacy in Central Asia) taking place to the north, and the ‘Scramble for Africa’ to the south, Bahrain was growing in strategic, as well as commercial importance. The Political Resident A senior ranking political representative (equivalent to a Consul General) from the diplomatic corps of the Government of India or one of its subordinate provincial governments, in charge of a Political Residency. , Major Percy Cox, was in agreement that Prideaux, in his capacity as Political Agent A mid-ranking political representative (equivalent to a Consul) from the diplomatic corps of the Government of India or one of its subordinate provincial governments, in charge of a Political Agency. , should have extended jurisdictive powers in Bahrain. Cox sent a petition to John Morley, Secretary of State for India, stating plainly that, in view of increasing foreign interest in the Gulf, it was desirable that the status quo of British dominance in the region be maintained, in part by giving the Political Agent A mid-ranking political representative (equivalent to a Consul) from the diplomatic corps of the Government of India or one of its subordinate provincial governments, in charge of a Political Agency. in Bahrain jurisdiction over foreigners. Despite Cox and Prideaux’s recommendations, efforts to implement an Order in Council A regulation issued by the sovereign of Great Britain on the advice of the Privy Council (in modern practice, upon the advice of government ministers). in Bahrain were put on the backburner until 1909. In May of that year, in light of Germany’s progress on their Baghdad railway project, Morley wrote to the Governor General in India, stating that ‘the competition to which trade in the Gulf is exposed is not merely commercial, but has a distinct political object. British claims to political predominance in the Gulf are based mainly upon the fact of our commercial interests having hitherto been predominant, and should trade, as a result of a German forward commercial policy, be impaired, our political influence would proportionately diminish’. Negotiations over Bahrain’s Order in Council A regulation issued by the sovereign of Great Britain on the advice of the Privy Council (in modern practice, upon the advice of government ministers). continued until the outbreak of the First World War, after which its implementation was repeatedly postponed until 1919. Issuing birth and marriage certificates was unlikely to create problems for British officials, but other more serious aspects of legal jurisdiction could. In criminal cases, not only did British officials have a duty to the Court of Justice and the individual under trial, they also had to consider their responsibility toward the Ruler of Bahrain, who required the British to wield foreign jurisdiction in such a way as to avoid involving him in ‘unpleasantness’ with neighbours in the Gulf. 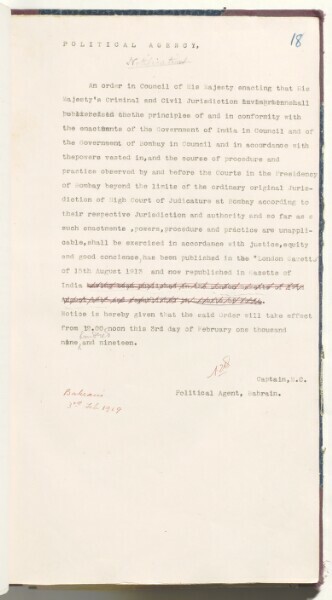 In February 1933, Percy Gordon Loch, the Political Agent A mid-ranking political representative (equivalent to a Consul) from the diplomatic corps of the Government of India or one of its subordinate provincial governments, in charge of a Political Agency. 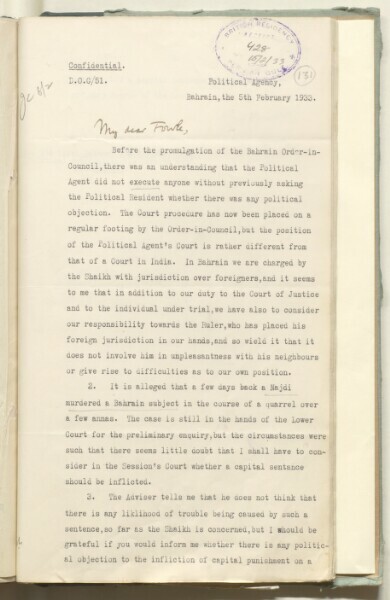 at Bahrain, in dealing with the case of a Najdi (a citizen from part of the newly-formed Kingdom of Saudi Arabia) who had murdered a Bahraini subject in the course of a quarrel over a few annas, sought advice from the Political Resident A senior ranking political representative (equivalent to a Consul General) from the diplomatic corps of the Government of India or one of its subordinate provincial governments, in charge of a Political Residency. and Charles Belgrave. Belgrave, the Adviser to the Shaikh of Bahrain, did not feel that there would be any risk in the Agent’s pronouncing the sentence of capital punishment. However, it is telling that the Agent still felt he needed to check whether there would be any political repercussions – as far as the Shaikh of Bahrain was concerned – in the British executing a Najdi in Bahrain. 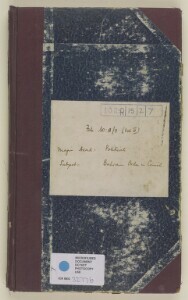 Britain’s jurisdiction in Bahrain, exercised by an Order in Council A regulation issued by the sovereign of Great Britain on the advice of the Privy Council (in modern practice, upon the advice of government ministers). , remained in place until 15 August 1971, when Bahrain formally declared its independence from Britain.